It has recently been revealed that Eddie Hearn rejected the offer for his fighter, Kell Brook to take on WBO Welterweight champion of the world, Timothy Bradley. Brook and Hearn gave several reasons for their decision, all of which are ridiculous in my opinion. 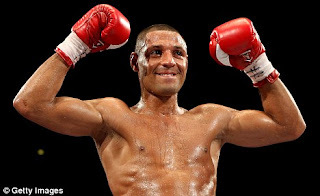 Okay, I understand that you want every advantage you can find in a world title fight, but if Brook did win a world title at home, fans would be demanding for him to go to the States and defend his title, just like they did with Joe Calzaghe. So why not go to America, and get the 'away' fight out of the way? Also, what if you lose your mandatory fight? Then you won't get a fight with Bradley or the Alexander/Bailey winner. Reason Two - "We want to build the fight with Bradley into a bigger fight" - I understand wanting participate in 'super-fights', but how many times will you get offered a fight with the champion at Welterweight? And how does Brook know the Bradley fight will still be on the table in a year's time? Bradley could have plans to fight other names by then. Reason Three - "We are only one fight away from a world title fight"- Yeah that's true, but if you would have accepted the offer from Team Bradley, then you would have been in a world title fight instead of being one fight away. Also, if Brook is talking about building fights to make them bigger, why not build a huge UK showdown with Amir Khan? That potentially, could be a lot bigger than a Brook/Bradley fight. In my opinion, Kell Brook has nothing to lose in fighting Timothy Bradley, if he get's beat, then he can always make the excuse that 'the fight came to early' or he can say he 'got beat by one of the P4P best fighters on the planet', if he wins the fight, then he's in the history books forever for being a world champion. And he walks into a huge Pacquiao/Mayweather Jr type of fight. Maybe I'm being harsh, maybe in the long run this will work out perfect for Brook and Hearn, but I just think fighters should take opportunity's while they can. What do you think? Did Eddie Hearn and Kell Brook make the right move?